Mark your calendars: In a matter of days, the coastal California town of Half Moon Bay, otherwise known as the World’s Pumpkin Capital, will host the Safeway World Champion Pumpkin Weigh-Off, where the second-biggest pumpkin ever recorded took home the gold last year. It begins in autumn morning darkness. Lines of pick-up trucks hauling gigantic pumpkins crowd the back streets of Half Moon Bay, a coastal California town south of San Francisco known as the World’s Pumpkin Capital. Farmers and local residents head to the Half Moon Bay I.D.E.S. Society grounds on Main Street, cups of coffee in hand, and stake out a place behind a line of hay bales facing the stage. 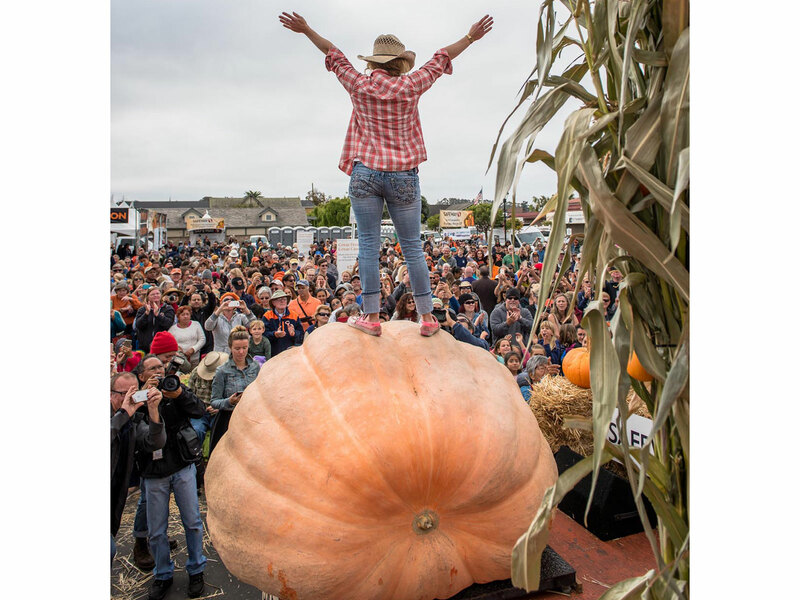 On the Monday before the Half Moon Bay Art & Pumpkin Festival, the Safeway World Champion Pumpkin Weigh-Off flies under the radar compared with the popular October weekend festival, but this harvest event is the best place to geek out over gargantuan gourds. The weigh-off began in 1974, when the winner was a 132-pound pumpkin. In 2017, the heavyweight champion tipped the scales at 2,363 pounds, the second-heaviest pumpkin ever grown in the world in recorded history. That’s still a little light compared to the current world record holder, at 2,624 pounds, from a 2016 weigh-off in Germany. The first pumpkins of the morning are hand-carried and placed on the five-ton capacity, industrial-strength scale, their weights tallied on a board behind the stage. But before long, a parade of forklifts, each with a behemoth pumpkin cradled in a special harness, drive to the stage. Teams of men delicately set each forklift’s charge on the scale, to avoid marring the gourd. A list of 12 official weigh-off rules cover everything from qualifying color (a specimen must be 75 percent yellow/orange in color, or it’s considered “squash”) to condition (free of rot, holes and cracks through the cavity, chemical residue, and soft spots). Standards are set by the Great Pumpkin Commonwealth (GPC), the major sanctioning body overseeing Giant Pumpkin growing competitions with more than 70 weigh-off locations around the world. Through the morning, the contenders grow ever larger—and so does the crowd. Musicians entertain in between contestants. Farmers compare notes on monster pumpkin seed acquisition and growing techniques, sometimes exchanging seeds while they watch the on-stage action. Superior seed lineage is only part of the winning formula, which also includes rich soil, mild temperatures, a lot of water, plenty of sunlight, and pumpkin TLC. “The low-tech, relaxed nature of the weigh-off is a contrast to the high-speed life just over the hill in Silicon Valley,” says Beeman. In a region where farming isn’t front of mind, the weigh-off serves as a connection to the land—something often lost in the excitement of the festival, with crafts and entertainment and other distractions. Over the course of about four hours, attendees wander in and out of the crowd to chat with neighbors, grab breakfast, and ogle at the pumpkins, of course. With a pay-by-the-pound prize system, the weigh-off rewards the champion of the day with $7 per pound. If it breaks the world record, the prize money grows to $30,000. Smaller prizes are awarded up to 20th place, for the largest California pumpkin, largest local pumpkin, and most beautiful pumpkin. For that contest, the crowd determines the winner out of three huge gourds with excellent color, shape and size. Lifted high above the audience on a forklift, whichever gets a loudest applause takes home the gold. The 2018 Safeway World Champion Pumpkin Weigh-Off is held on October 8. The Half Moon Bay Art & Pumpkin Festival follows on October 13-14.